It was a year ago today that Leonard Pennario died and I cannot decide if it feels like a long year or a short year. It feels long because of all the time I have spent missing him and thinking about him. But it feels short because of all the time I have spent working. The time does fly when you are having fun, and doing this book is a never-ending thrill. Well, I guess it will have to end sometime! I will have to finish this thing up. I cannot go on for years like this, that is for sure. I work on my Pennario project for at least a couple of hours every day, and as my friends are always quick to tease me, I think about him all the time. You cannot go on forever with a dead concert pianist living in your head. I believe I have said that several times along the line. I know I have thought it! I would put the book at half done, maybe three quarters done. A lot of people ask me for a percentage so there, that is the best I can do. There is just so much to get a hold of and research and collect. It is not like writing a memoir about your own darn self. It is also not like writing a book about some no-count pianist. Sometimes I think Pennario downplayed how great he was to me so I would go ahead and take this on. "Oh, Heifetz? That was nothing. That was just a few concerts we gave." "What do you mean, how did I learn that Grieg concerto in a week when I was 12? It was easy. It was nothing. C'mon, let's go out to this movie." I will never forget my life that week Pennario died, that is for sure. In this crazy hotel room, calling the New York Times, the Los Angeles Times, the Associated Press. For some reason I forgot the Washington Post. The Washington Post never entered my mind losing Leonard. I feel bad about that. What a week. Flying out to California and dealing with that crazy Hertz. Wow, I remember writing that blog post. I did not want to let on that anything terrible was happening. Then losing Leonard the next day. Above is the picture Howard ran with my Web log that day. 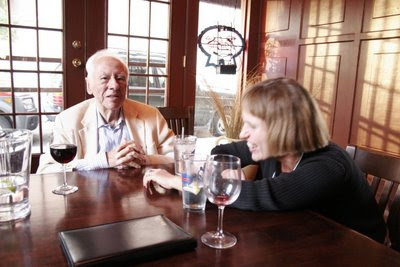 It shows Pennario and me in the Century Grill in Buffalo deciding we would do a book together. I have a memorial Mass scheduled for Pennario on October 25. That was the earliest they could give him a Latin Mass and I know that was what he wanted. So that is settled anyway. Meanwhile I hope that he is happy with how things are going. I hope he is not aghast that it is taking so long! Oh my. Thanks for sharing that, Mary. It is with tears in my eyes and after having read all the links that I say to you, I am so sorry for your loss. And for the loss of the world.